There is no doubt tat our nation is in the midst of a very serious economic crises that in 2008 extended to our regional economy as well as our local housing market. As a result, last year was one of the most challenging in recent memory. Everyone was impacted in some way as this was certainly an apprehensive time for those buying and selling property. Both buyers and sellers encountered a whole host of new challenges ranging from getting accurate appraisals to dealing with new requirements from lenders. In light of all this, our Realtors really made the difference. They helped overcome obstacles. They gave some great advice and showed a lot of compassion and understanding to their customers and clients alike. Most importantly, they were a calm and trusted voice of reason in every transaction. Our Realtors experience and knowledge of our local marketplace really paid off for our clients. In this current real estate market, accurate pricing, effective marketing and experienced representation, are critical in order to succeed. Now more than ever, choosing the right Realtor makes all the difference. 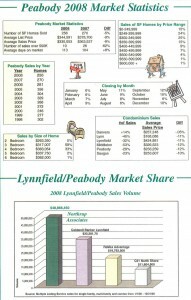 In Lynnfield, the average sales price for a home fell by 12% in 2008. During that time, the total number of homes sold declined by 29%. Particularly impacted, were the number of homes sales over $600K, which dropped by 54%. 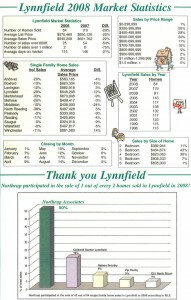 With this in mind, Northrup Realtors were involved in the sale of 1 of every 2 homes sold in Lynnfield in 2008 (42 of 84). Remarkably, Northrup's Realtors also participated in the sale of 80% of the homes sold over $600K (20 to 25).